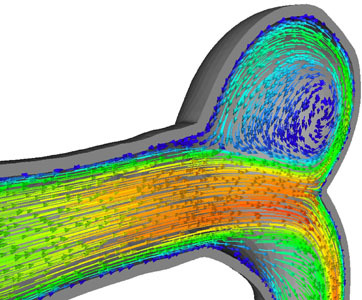 The arterial geometry used here is a close approximation to the computed tomography (CT) model of a single-artery segment of the middle cerebral artery of a 57 year-old male with aneurysm. It can be seen at Cerebral Aneurysm -- Hyperelastic Arterial Wall. The arterial wall (i.e. the structural mechanics part of the problem) is modeled with the continuum element made of hyperelastic (Fung) material. The numerical methods used in this computation were introduced and implemented on parallel computing platforms by the T*AFSM. The set of numerical methods introduced by the T*AFSM over the years and used in this computation includes the DSD/SST formulation [1-4], the quasi-direct FSI method [5, 6], the stabilized space-time FSI (SSTFSI) technique , and special techniques for arterial FSI computations [8-10]. The CT model of the artery approximated in this computation was reported in . The inflow velocity used in the computation during the cardiac cycle is a close approximation to the one reported in , and can be seen at Cerebral Aneurysm -- Hyperelastic Arterial Wall. The traction condition imposed at the outflow boundary during the cardiac cycle is based on a normal blood pressure profile, which can also be seen at Cerebral Aneurysm -- Hyperelastic Arterial Wall. 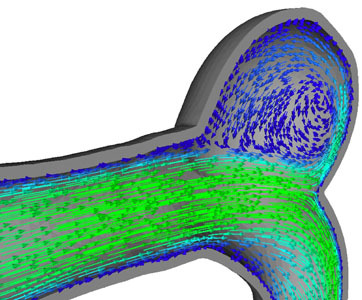 One of the special arterial FSI techniques used in the computation is generating layered, high-refinement meshes near the arterial walls to improve the boundary layer resolution (see ). The special mesh is shown below. The computation was carried out on the ADA system at Rice University. For more details on this computation, see . Fig. 1. Fluid mechanics mesh at the inlet (red), outlet (blue) and fluid-structure interface. For details, see . Fig. 2. Blood-flow patterns when the inflow velocity is at its minimum and maximum (top), and when the blood pressure is at its maximum and secondary maximum (bottom). For details, see . 1. T.E. Tezduyar, "Stabilized Finite Element Formulations for Incompressible Flow Computations", Advances in Applied Mechanics, 28 (1992) 1-44, doi: 10.1016/S0065-2156(08)70153-4. 2. T.E. Tezduyar, M. Behr and J. Liou, "A New Strategy for Finite Element Computations Involving Moving Boundaries and Interfaces -- The Deforming-Spatial-Domain/Space-Time Procedure: I. The Concept and the Preliminary Numerical Tests", Computer Methods in Applied Mechanics and Engineering, 94 (1992) 339-351, doi: 10.1016/0045-7825(92)90059-S.
3. T.E. Tezduyar, M. Behr, S. Mittal and J. Liou, "A New Strategy for Finite Element Computations Involving Moving Boundaries and Interfaces -- The Deforming-Spatial-Domain/Space-Time Procedure: II. Computation of Free-surface Flows, Two-liquid Flows, and Flows with Drifting Cylinders", Computer Methods in Applied Mechanics and Engineering, 94 (1992) 353-371, doi: 10.1016/0045-7825(92)90060-W.
4. T.E. Tezduyar, "Computation of Moving Boundaries and Interfaces and Stabilization Parameters", International Journal for Numerical Methods in Fluids, 43 (2003) 555-575, doi: 10.1002/fld.505. 6. T.E. Tezduyar, S. Sathe, R. Keedy and K. Stein, "Space-Time Finite Element Techniques for Computation of Fluid-Structure Interactions", Computer Methods in Applied Mechanics and Engineering, 195 (2006) 2002-2027, doi: 10.1016/j.cma.2004.09.014. 7. T.E. Tezduyar and S. Sathe, "Modeling of Fluid-Structure Interactions with the Space-Time Finite Elements: Solution Techniques", International Journal for Numerical Methods in Fluids, 54 (2007) 855-900, doi: 10.1002/fld.1430. 8. T.E. Tezduyar, S. Sathe, T. Cragin, B. Nanna, B.S. 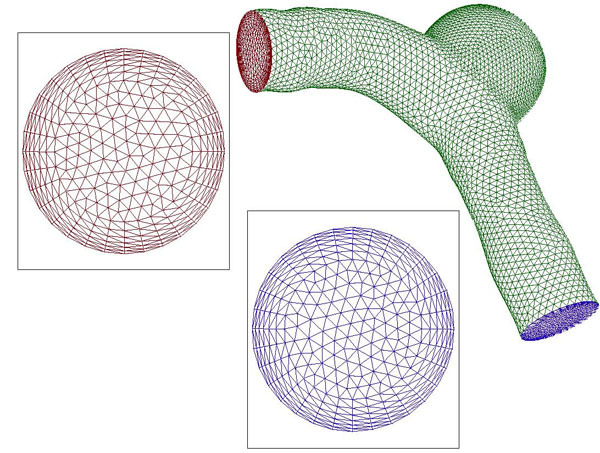 Conklin, J. Pausewang and M. Schwaab, "Modeling of Fluid-Structure Interactions with the Space-Time Finite Elements: Arterial Fluid Mechanics", International Journal for Numerical Methods in Fluids, 54 (2007) 901-922, doi: 10.1002/fld.1443. 9. T.E. Tezduyar, S. Sathe, M. Schwaab and B.S. Conklin, "Arterial Fluid Mechanics Modeling with the Stabilized Space-Time Fluid-Structure Interaction Technique", International Journal for Numerical Methods in Fluids, 57 (2008) 601-629, doi: 10.1002/fld.1633. 10. T.E. Tezduyar, M. Schwaab and S. Sathe, "Sequentially-Coupled Arterial Fluid-Structure Interaction (SCAFSI) Technique", Computer Methods in Applied Mechanics and Engineering, 198 (2009) 3524-3533, doi: 10.1016/j.cma.2008.05.024. 11. R. Torii, M. Oshima, T. Kobayashi, K. Takagi and T.E. Tezduyar, "Influence of Wall Elasticity in Patient-Specific Hemodynamic Simulations", Computers & Fluids, 36 (2007) 160-168, doi: 10.1016/j.compfluid.2005.07.014. 12. R. Torii, M. Oshima, T. Kobayashi, K. Takagi and T.E. Tezduyar, "Computer Modeling of Cardiovascular Fluid-Structure Interactions with the Deforming-Spatial-Domain/Stabilized Space-Time Formulation", Computer Methods in Applied Mechanics and Engineering, 195 (2006) 1885-1895, doi: 10.1016/j.cma.2005.05.050.